Would it be better for you to continue to pay rent or to actually buy a property for your own stay? Let’s do some math. Let’s assume that you are paying $6,000 in monthly rental for a nice condo in D9, 10 or 11. A search on Square Foot Research will tell us that, based on historic data, we can get 1,300 – 1,400 sqft in D9, 1,400 – 1,600 sqft in D10, and 1,300 – 1,400 sqft in D11. However, looking at the average transacted prices (also from SFR), similar properties are going for an average of slightly over $2m. Let’s further assume that you are young enough to take out a 30-year loan at 80% LTV and have enough money to buy a $2m property, which means a lump sum of at least $460,000 of savings to pay for the down-payment as well as the stamp duty of 3%. Note that if you’re liable for ABSD, you’ll need to tack it on to your cash outlay. With $460,000, and constant rental of $6,000 per month, you can pay for 6.4 years of rent. Sure, you’d have stayed in the place for 6.4 years, but you’re not getting anything back in the end. Alternatively, you can buy a $2m property at 80% loan for 30 years (assuming you qualify). At an interest rate of 1.50% pa, your monthly mortgage payment would be $5,522, of which $2,000 would be interest and the rest would be principal. Note that this is the proportion in the beginning, and, assuming that interest rates stay the same, a higher proportion is going into principal over time. Of course, as a home owner, you would have to pay additional costs in the form of maintenance fees/sinking fund (typically $400 – $600 per month) and property tax (about 4% of annual value for own-stay). I’ve conservatively assumed monthly maintenance of $600 and monthly property tax of about $200. In all, the home owner would be paying slightly more at $6,322 per month. However, only $2,800 of that would be going to other people. The rest would be going towards equity in the property. At the end of 6.4 years, your liability would have reduced from $1.6m to about $1.32m. Add back all the payments you’ve made for mortgage, maintenance and property tax of $480k, and you come to a breakeven figure of $1.8m. Basically that means that after 6.4 years, if your property price hasn’t gone down by more than 10%, you’re better off buying than renting. But what if the interest rate goes up? At 3.50% pa, the monthly mortgage payment would rocket to $7,185, with interest component at $4,667 and principal component at $2,518. Adding in the maintenance and property tax, the home owner’s monthly payment balloons to $7,985. That’s almost $2,000 more than he would pay each month in rent!! Shocking! But if we look at how much is going to other people, it’s only $5,467. Still better than paying $6,000 to the landlord, I’d say. Besides, it’s likely that the landlord will be looking at a higher rental to cover his mortgage. Doing the same calculation, the outstanding loan would be $1.39m and total payments would be $607k, bringing the breakeven figure to just about $2m. Meaning that even at 3.50% interest rate, all you need is for the property price to not fall to do just as well as renting. Since the interest rate should only go up with an improving economy, I think the risk-reward is pretty much skewed in your favour. I am not advocating that buying is for everyone. Not everyone who is renting their home is in the position or in the right situation to buy a property to live in, given the large amount of upfront cash that is required, personal/career circumstances, and/or view of the potential movement of the property market, among other considerations. However, I think that this is something that can be considered as an alternative if the conditions are right. If this is something that you are considering, please contact Natasha. We would be happy to have a chat and to offer our opinion. What if you include the the opportunity cost of investing the SGD460k downpayment? For example a reasonably safe REIT or corporate bond at 5% yield. How does that impact the calculations? Hi Arcteryx, thanks for your comment. While I appreciate where you are coming from with this question, this throws in many more moving parts in the equation, for example, capital gains or losses from the REITs or bonds, or that the yield from the instruments are stable or growing. You’ll also need to do quite a bit of financial planning to make sure that your bonds come due at the right time so that you are not subject to price risk. If we approach the problem like engineers and make some assumptions to disregard all those moving parts and just assume that prices and yield stay constant, then we can do a quick calculation. Inputing a 5% cash yield on the $460k, we find that the money then lasts for 7.7 years, an extension of 1.3 years. However, in my opinion, this does not change the premise of the analysis, but only delays the inevitable. That being said, there is certainly a yield at which it is better to invest the money than to buy a property. I stated in the article that the monthly amount going to 3rd party in the case of the property purchase is $2,800. If you are able to invest such that the rent less your investment return is $2,800, then you are indifferent. In our example, this would mean you would need to generate $3,200 a month or a yield of 8.35% p.a. on the $460k. While it is not an astronomical figure, you would certainly be taking on a fair amount of risk. While I realise that past performance is no guarantee of future results, has there been any time in the past 20 years or so where the Singapore property market has risen 6.4 years in a row without a fall of more than 10%? 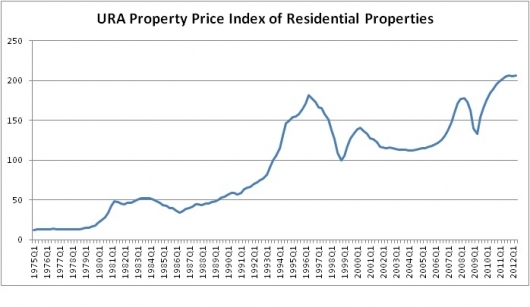 Hi Arcteryx, based on URA’s property price index, there has only been 1 period (1994 – 1997) in the last 40 years that in any 6.4 year period, prices were lower at the end by more than 10% than at the beginning of the period.